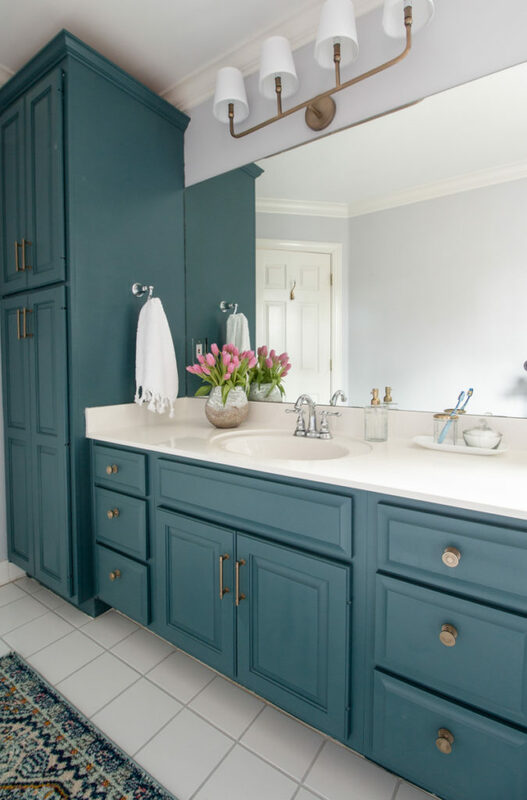 The power of paint to transform a room, especially a bathroom, never ceases to amaze me. What also amazes me is the power of high-quality paint to make the job easier and hassle-free. 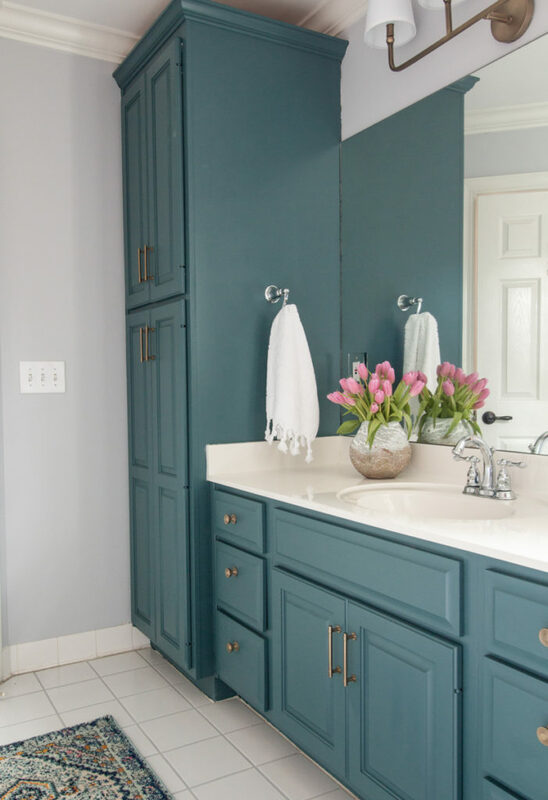 For a fresher look in our daughter’s upstairs bathroom I envisioned teal cabinetry and grey walls. 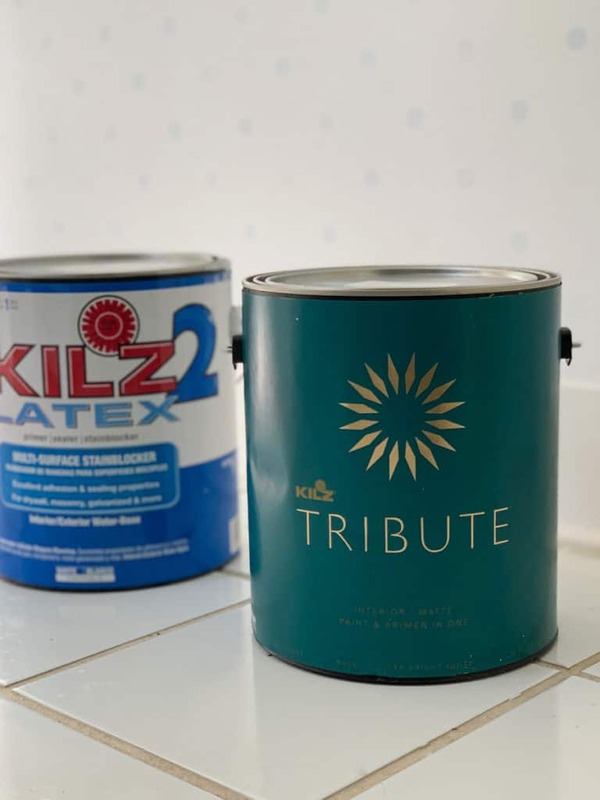 KILZ ® TRIBUTE® Paint & Primer had the perfect shade of teal to bring the vision to life. I used OCEANS DEEP #TB-60 in satin. I’ve used several shades of teal recently and this one is by far my favorite. It has a touch of grey in the mix which makes it vibrant without being too bright. For the walls, I used BRUSHED METAL #TB-32. 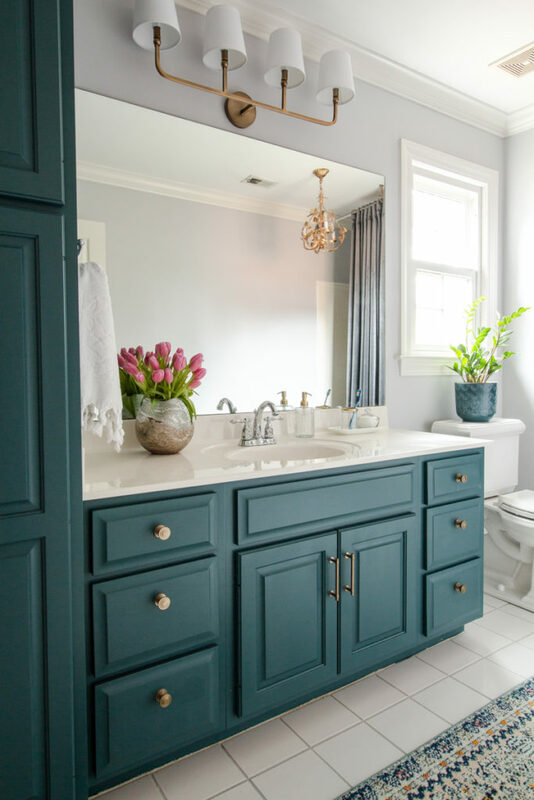 A soft grey with hints of blue and violet to make it a bit more cheerful than your average grey. I would recommend this color for a room that receives warm light, like in a south facing room. 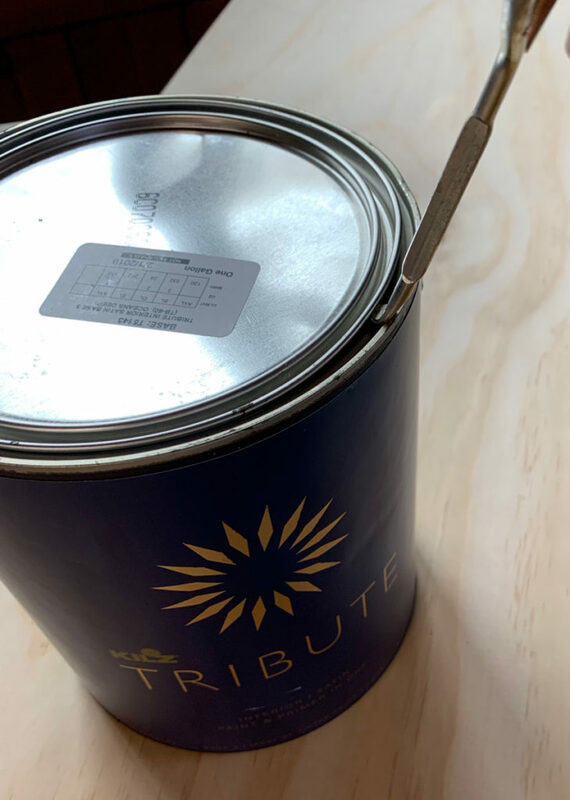 Of course every good paint job starts with a great primer. But before we get too far ahead, let’s take a look at where we began. 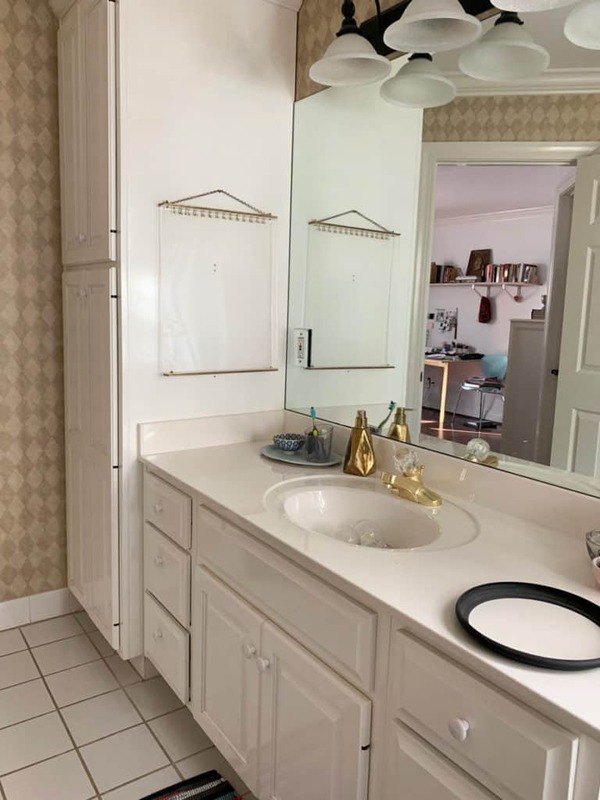 It’s a nice sized bathroom but the dated fixtures, wallpaper and the uninspired cabinets make the room feel just that. Uninspired. 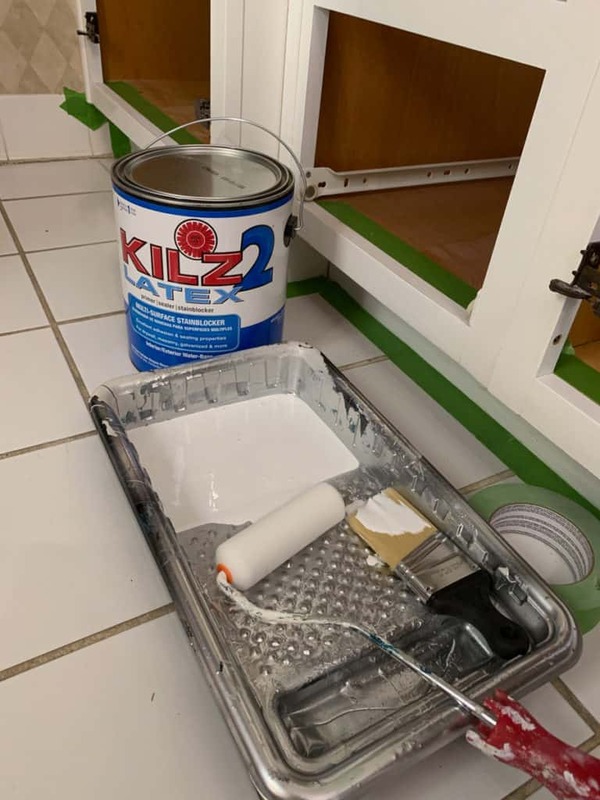 Then it was time to move onto the wall paint, KILZ ® TRIBUTE® Paint & Primer. The quality of this paint was more than evident after just a few passes with the paint roller. It completely covered and hid all traces of the polka dots in one pass! In fact, it hardly needed a second coat. 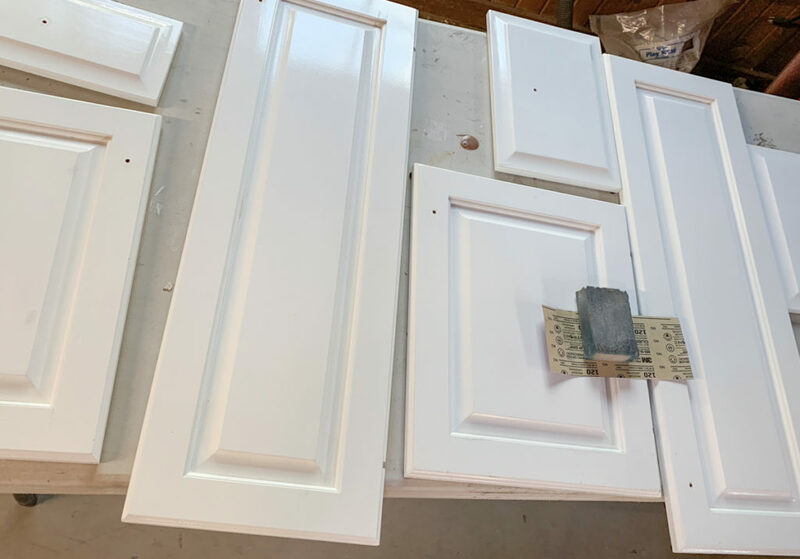 Because the cabinets had what I think was the original paint/factory finish, I was certain to give them a good cleaning, a light sanding and then a wipe down with a sanding deglosser before applying KILZ 2® LATEX Primer. 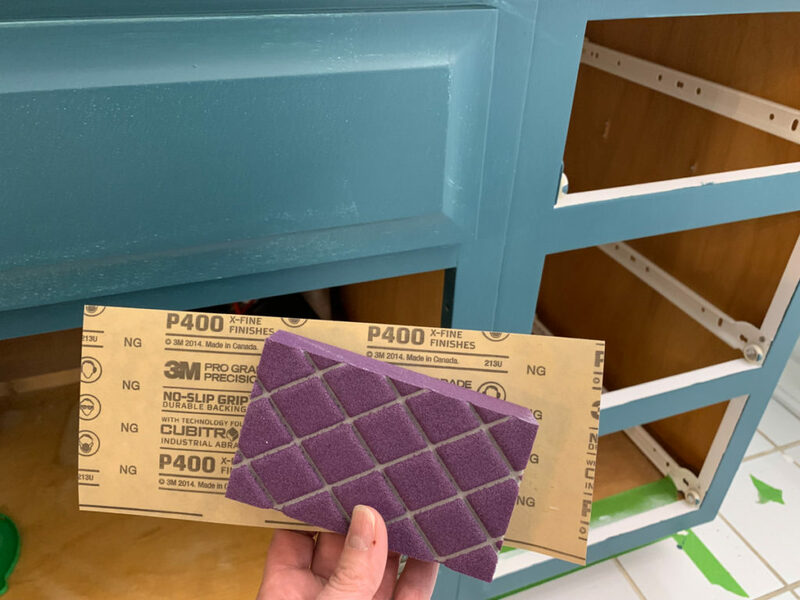 Thi﻿s will create a uniform finish which hides imperfections, light marks and blemishes while also enhancing the paint’s grip to the cabinets. 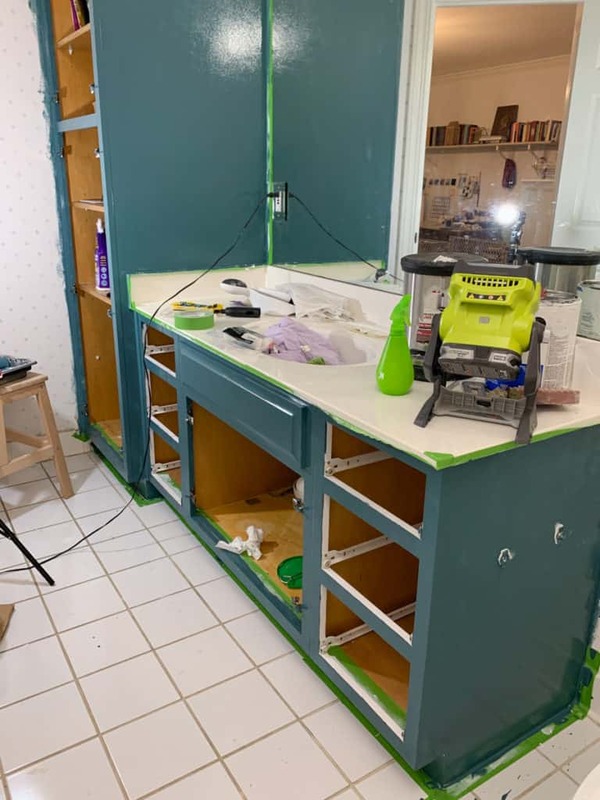 My preferred method of painting cabinets is to roll the base and spray the doors and drawers. This was a first time for removing the drawer fronts instead of the drawers in a cabinet painting project. 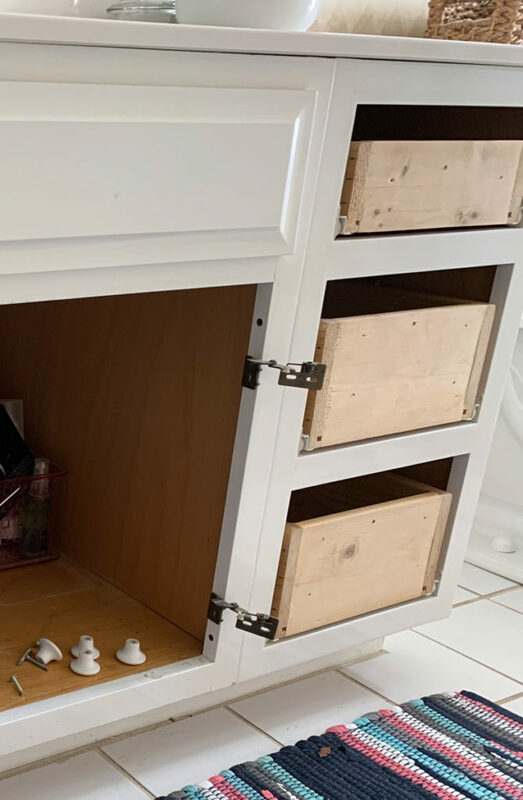 I found it very difficult to put the fronts back on straight and level because we forgot to label the drawers as well as the fronts. I followed the same prep procedure with the cabinet doors and drawers. Clean, sand, degloss then spray. Did I mention this paint is available online at either Amazon or Build.com? That’s right. 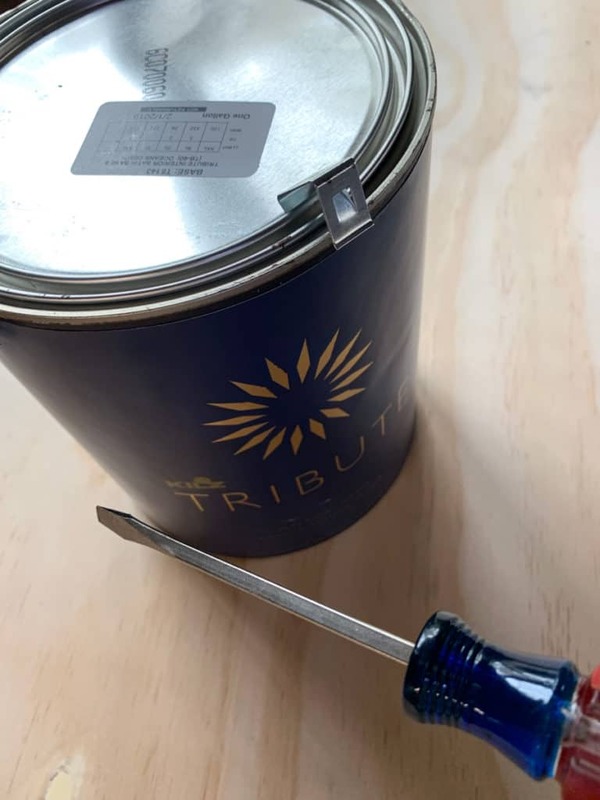 You can shop for paint from the convenience of your home and have it delivered right to your door. I like to give the paint a good shake and roll before I open the can. I lay it down on its side and roll it back and forth on the ground. The paint comes securely packaged in custom paint boxes and encased in a sealed plastic bag. 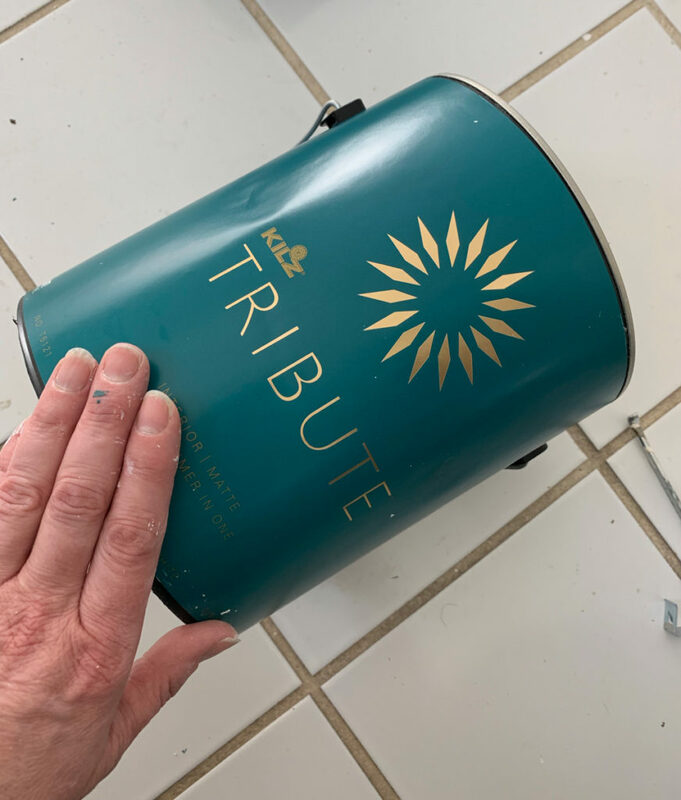 After removing the cans from the packaging, simply remove the clips with a screw driver and then open the can as usual. If you follow me on Instagram, then you may have seen my unboxing Story. I love giving y’all all the behind the scenes on Instagram. Give me a follow here. Then it was time for paint. 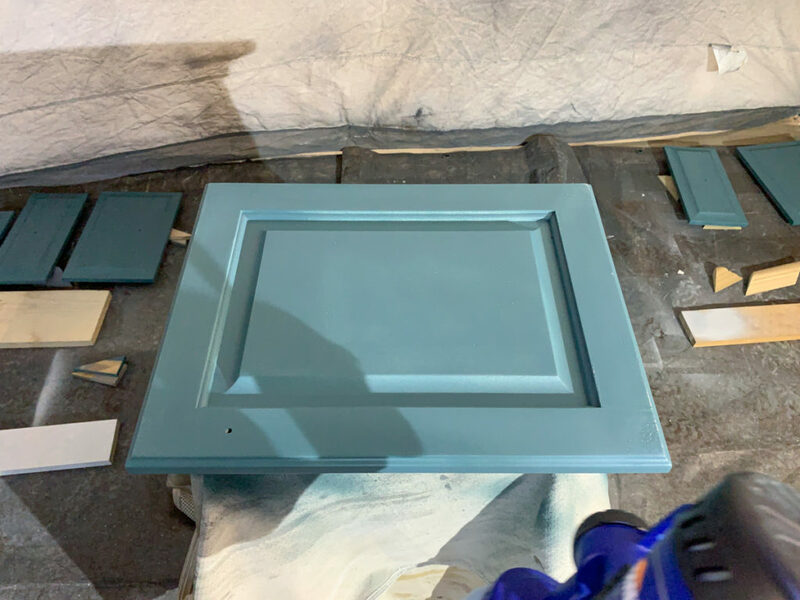 I sprayed two coats of Oceans Deep in the satin finish. I also applied two coats to the cabinet bases. In between coats, I sanded with 400 grit sand paper to insure that I had a nice smooth finish. 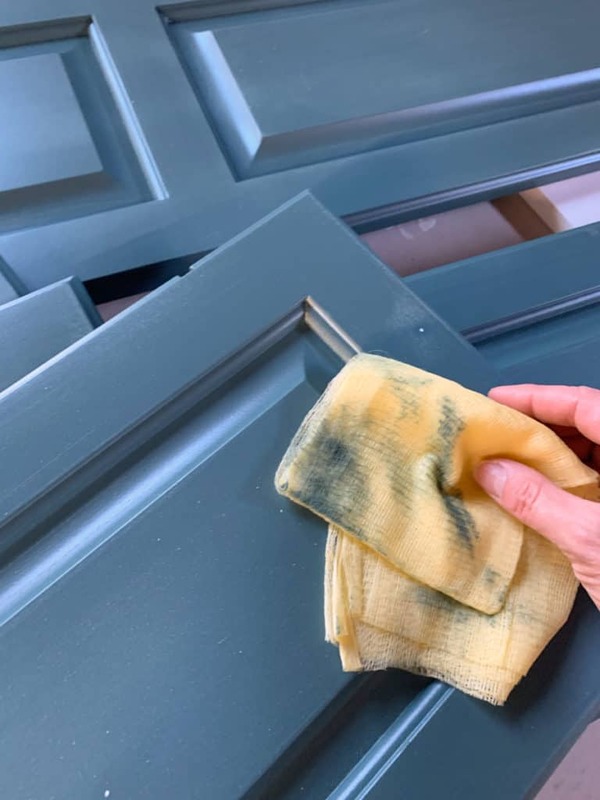 After sanding, I wiped the doors with a soft cloth and then a tack cloth. It’s an extra step that makes a huge difference in a beautiful, professional looking finish. 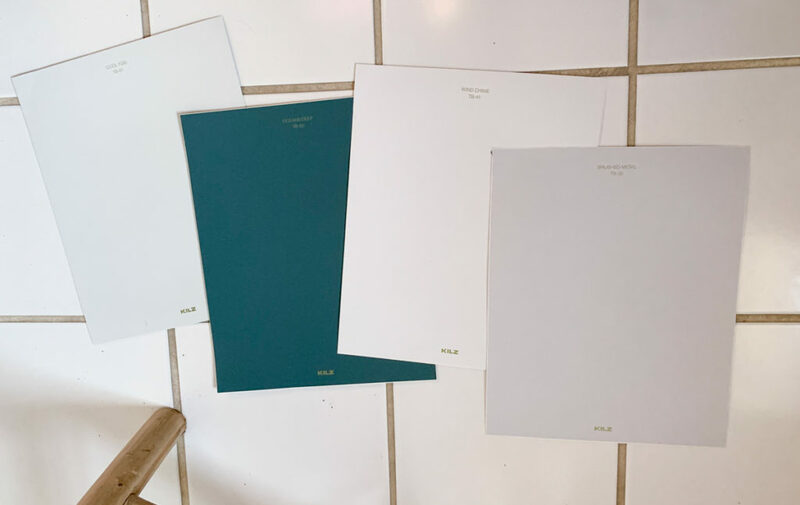 You may be wondering how I picked the right shade of paint from a computer online? I ordered peel and stick samples of the exact shades I was considering. You can also order sample pots, but this is super easy and mess free. Amaz﻿﻿on is now offering free KILZ Tribute Peel & Stick Samples and free shipping is available for Amazon Prime members! Check ou﻿﻿t all 100 colors available including whites & greys, yellow & oranges. greens and blues﻿﻿! 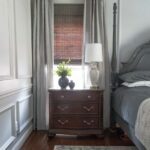 You can also order wet paint samples﻿﻿, but this is super easy and mess free. 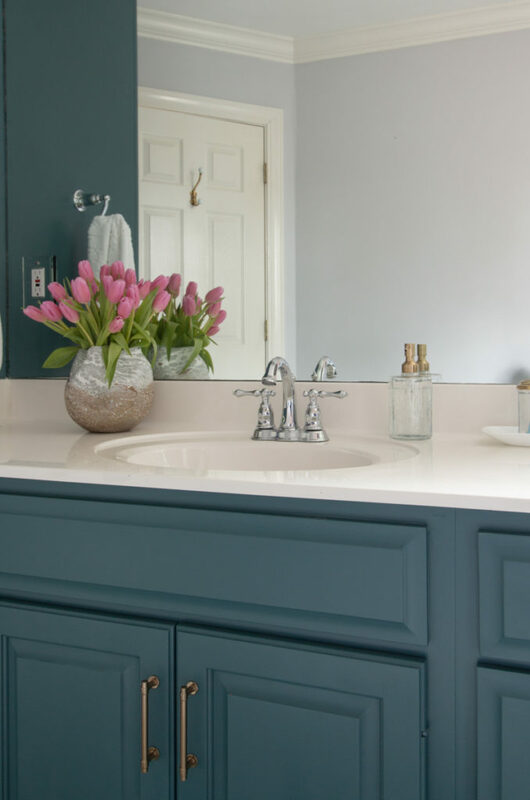 We couldn’t be happier with the results of this budget friendly makeover with paint! I’ll break down the rest of the room details in a following post. 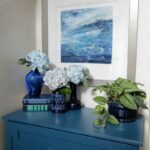 So tell me, what would you transform with paint in your home? WOW! 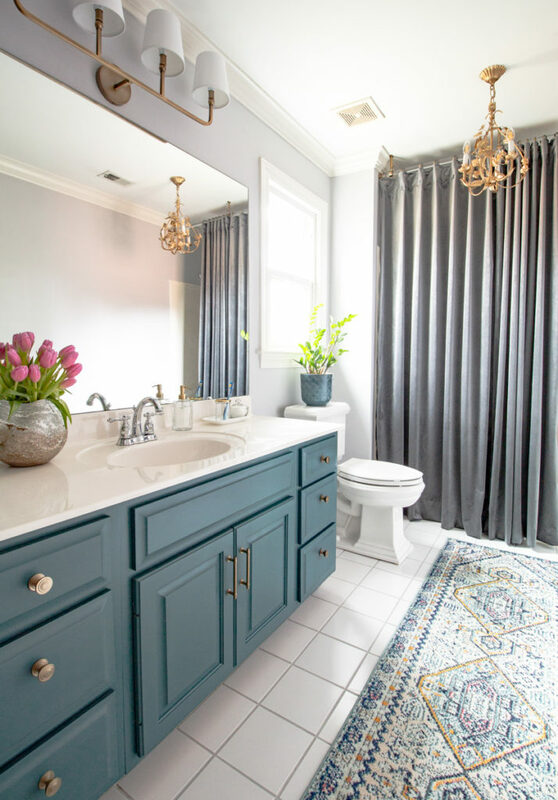 Leslie the bathroom makeover is amazing! I like that idea of the peel and stick paint samples! Thank you so much! She is very excited to come home to a “new” bathroom next week! Will definitely give him all the hugs!! 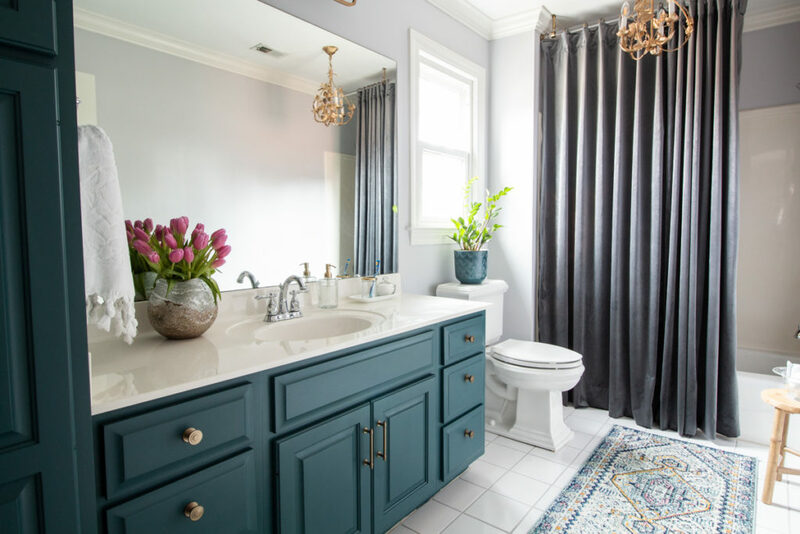 This bathroom makeover is so pretty! 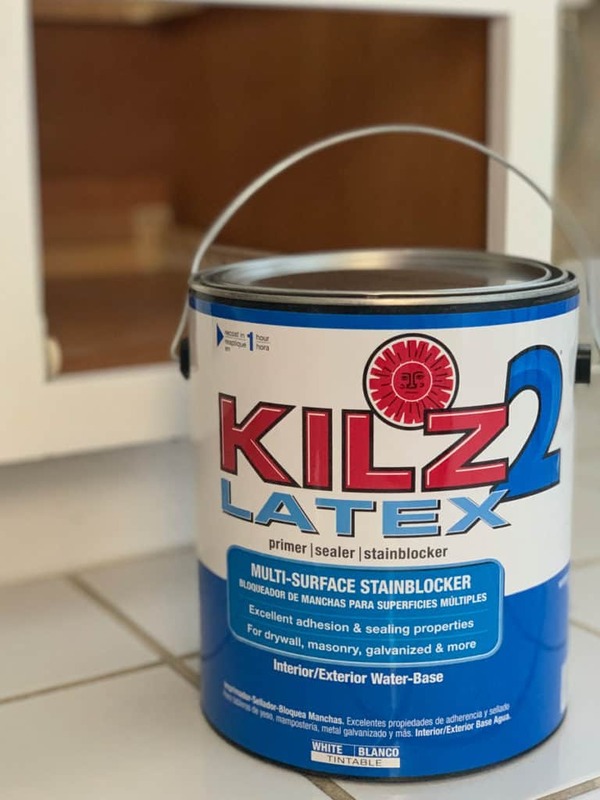 I had no idea Kilz had regular paint; I thought they just did (amazing) primer. 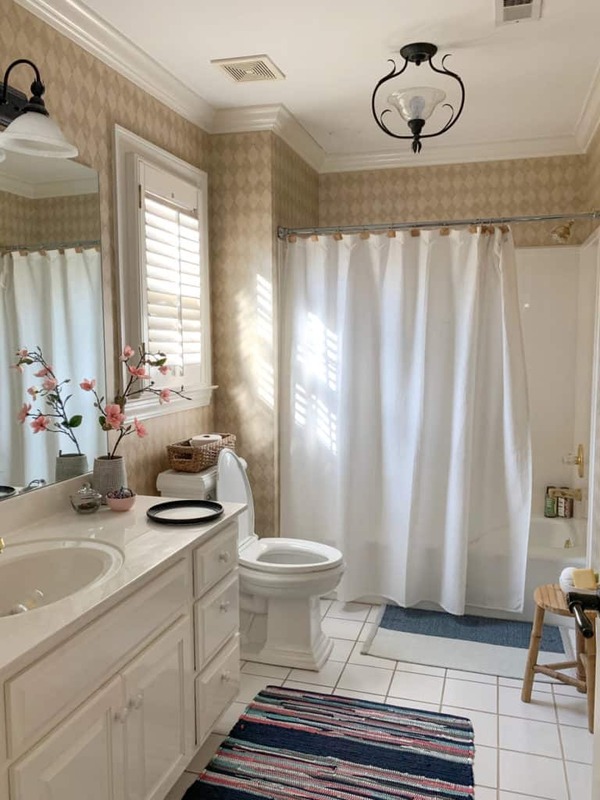 Love so much about this room: the cabinet color, the shower curtain, the rug. Can’t wait for all the details! 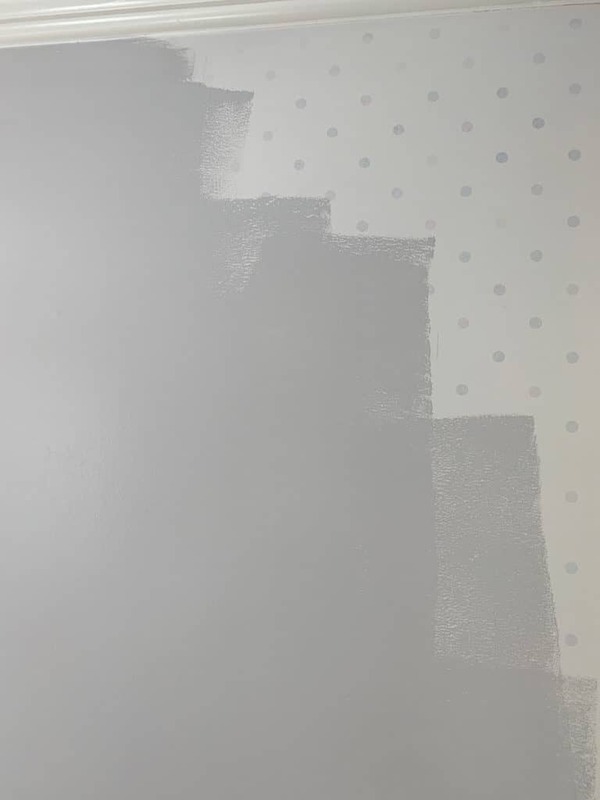 I’m crazy impressed with how well the paint covered those polka dots – never would have guessed a paint could do that. The fact that it is Kilz explains a lot! Yes, their paint is very high quality, as demonstrated by the way it covered those dots!! 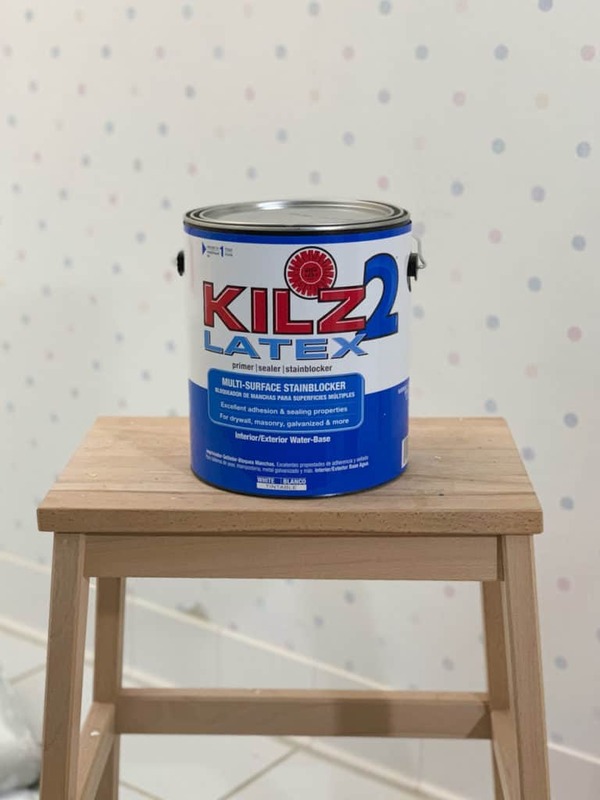 This is the second line of paints I used from KILZ and have been very pleased with the durability too! 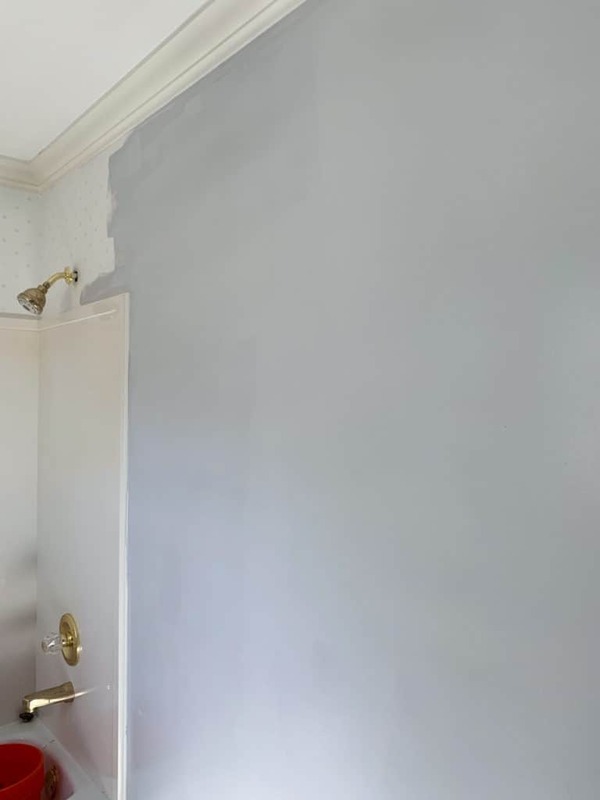 It’s definitely a project you could tackle in a weekend if you didn’t need to remove wallpaper. 😉 I also had a plumber come and handle that part for me since my husband was traveling for work at that time. Something bigger like a kitchen would likely take a couple weekends or maybe a little more, depending on the number of cabinets. 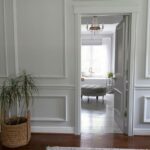 I would find a way to convince him that he will still have a solidly built kitchen of oak and painting them does not decrease the value of them anymore. in my opinion. 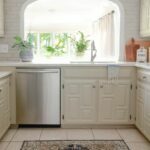 So many high end kitchens are built these days with painted cabinets, it’s not like wood tone cabinets garner a higher dollar figure on resale. Start with one bathroom and I bet you could convince him to proceed from there! 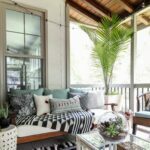 What a beautiful room transformation! You always find the prettiest colors, and execute the design plan with precision. I bet your daughter is over the moon with her new space. Thank you so much! She is very excited to come home to a “new” bathroom next week! Wow, what a great transformation!!! My daughter’s bathroom will need a complete overhaul when she moves out since she’s completely destroyed it with her piggy ways. This might just be the answer for her vanity!! Beautiful job!